Very similar to a gazebo, a pavilion is an outdoor entertaining space that is open-air, yet under a roof for some protection from the elements. They are freestanding and away from the main part of a home or residence. Pavilion plans can be large or small and are usually intended for relaxation. They may also be seen near swimming pools as a shade or cabana-like structure to shelter from the direct sun. 205 Sq. 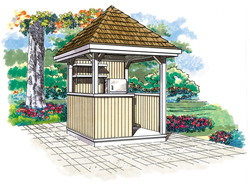 Ft., Width 17'-0", Depth 17'-0"
Our collection of pavilion plans includes many styles and sizes perfect for your backyard needs. We offer detailed blueprints that allow the buyer to visualize the look of the entire finished project. With a wide variety of plans, we are sure that you will find the perfect do-it-yourself project to fit your needs and style.